Gandhi (1982): Dir. Richard Attenborough. Written by: John Briley. Starring: Ben Kingsley, Roshan Seth, Rohini Hattagadi, Saeed Jaffrey, and Candice Bergen. Rated PG for brief violence and language. Running time: 191 minutes. Few people merit a biopic on this scale, so why not grant it to one of the preeminent figures of the twentieth century? And grant the role to Ben Kingsley, whose paternal ancestry came from the same area where Gandhi lived? 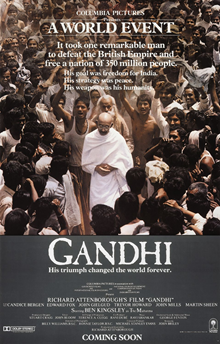 Perhaps lauded more for its content than form, Gandhi boasts a towering performance that mostly makes up for its conventionality. Following the Mahatma from his early days in South Africa, the film covers his fight for Indian independence from the British Empire. His strict adherence to nonviolent protest prolongs the conflict for years on end and confounds both his peers and the British authorities, but ultimately results in a new Indian state. Boasting the budget for such an epic, director Attenborough pulls out all the stops, painstaking recreating India in the early twentieth century. Yet the film never loses its human focus, and Briley’s screenplay eases us into the political and social complexities of the country pre-independence. With a film like this, however, the main selling point is Sir Ben as the Great Father. Kingsley embodies the figure completely, in a performance simultaneously titanic and humble. It’s a shame that the film’s ambition never vaults to the heights of its legendary figure—it doesn’t explore the conflict between man and legend like another film in this countdown, 1970’s Patton. That not to say Kingsley’s Gandhi exudes godlike perfection—the film covers the tremendous pressure he received when his followers did not adhere to nonviolence. But the film might have done more to surprise us. We experience all the scenes we expect: we see the bumbling, anachronistic British authorities and hear all the Mahatma’s famous catchphrases. I enjoy this love letter to perhaps my favorite politician of all time, even if the film doesn’t delve deep into the psychology or mythmaking of the Great Father.